Sir Ridley Scott and Kevin Macdonald are asking YOU to help with n Historic Global Film Experiment. All you have to do is Shoot Your Life in a Day on July 24. YouTube joins world famous filmmakers Ridley Scott and Kevin Macdonald in asking people around to world to help them create the first user-generated feature-length documentary film shot on a single day - July 24, 2010. Life in a Day is a historic global film experiment that enlists the global community to capture a moment of their lives on Saturday, July 24 and to upload that footage to www.youtube.com/lifeinaday. Academy Award-winning director Kevin Macdonald (State of Play, Last King of Scotland, Touching the Void) will direct, bringing together the most compelling footage into a feature-length documentary film. The project will be executive produced by Ridley Scott (Robin Hood, Gladiator, Black Hawk Down) and produced by his company Scott Free Productions. Individuals whose footage makes it into the finished film will be credited as co-directors and 20 of these contributors will be flown to the 2011 Sundance Film Festival for the film’s world premiere. Life in a Day is one of several efforts by YouTube to push the boundaries of music, art, and now film. YouTube Symphony Orchestra and the recently announced YouTube Play partnership with the Guggenheim are examples of the convergence of online video with traditional arts and Life in a Day takes this effort into the cinematic realm. 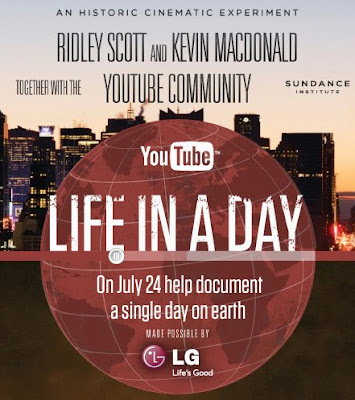 LG Electronics is supporting Life in a Day as a key part of its long-standing Life’s Good campaign and to support the creation of quality online content that can be shared and enjoyed by all. Scott Free will work with Rick Smolan, creator of “A Day in the Life” and CEO of Against All Odds Productions, a California-based organization that specializes in the execution of large-scale global projects that combine story-telling with state-of-the-art technology, to distribute cameras to individuals in remote regions of the world in an effort to ensure that the film is as inclusive and representative as possible. To learn more and upload footage after July 24, please visit www.youtube.com/lifeinaday. Over at the Life in a day YouTube Channel.